Ever since the inception of our marriage, God has given us a strong desire to teach and learn as much as we can about speaking God’s life-giving words. Whether it is speaking them to build our faith or speaking them to change situations, the investment of dedicating time to speaking God’s Word has an immeasurable return. And the best part? When you speak His Word, good things happen. Although our family focuses on speaking life-giving words in all areas of lives, we want to share a little bit today about the importance of speaking life-giving words specifically over your marriage! Why speak life over your marriage? To protect it. The enemy is constantly trying to tear down the godly institution of marriage. One major way the enemy is able to divide and conquer many marriages is through the sin of speaking lies and unkind words over one another. Just like any seed, when bad seeds are sown into our marriages by ugly words, bad fruit will grow as a result. The enemy is the father of lies and will take any and every opportunity to steal the life and love out of your marriage covenant. While it isn’t always easy to speak God’s life-giving words all day long, it is something toward which every believer should ultimately strive. The Word of God tells us that without faith it is impossible to please God (Hebrews 11:6). One major way that we are taught to build our faith is by reading and speaking God’s Word. When we take the time out to read His Word, we are renewing our minds with His thoughts and instruction on life – replacing old worldly mindsets. This new understanding naturally will result in our mouths speaking more life-giving words. Combined with praying God’s Word and confessing it out loud on a daily basis, we are showing God how important His Word is to us. Another wonderful byproduct of this type of obedience is that you will begin to see an increase in speaking words of faith and love in areas of your life where words of doubt and fear once prevailed. 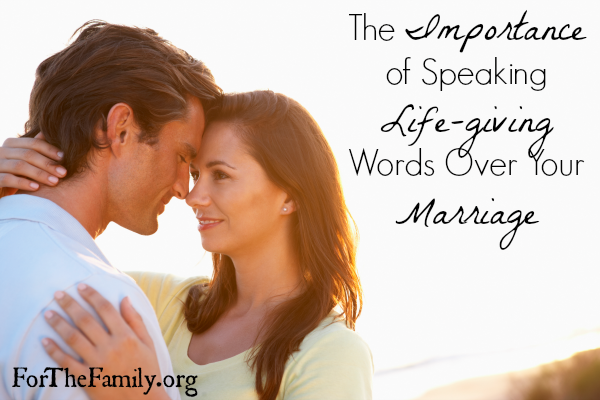 What if you don’t feel like speaking faith-filled words of life over your spouse? Do it anyway! Certainly there are times where we really don’t want to say anything nice to our spouses. As a matter of fact it can be down right tough! What should we do in those times? Speak God’s Word anyhow. Not only will you be honoring God and your spouse, but you will be doing the necessary hard work it takes to build your faith and ability to persevere in your marriage. Take the time today to sit down with your spouse and agree to speak kind, faith-filled, life-giving words over one another on a daily basis. We are constantly coming up with different confession lists to speak over each other. Even if your spouse in not a Christian, it is unlikely s/he will see this as a bad idea. Once you and your spouse are in agreement on the importance of speaking life-giving words over your marriage, watch God come in and do what only He can – bless your marriage above what you could ask, think, or imagine!